Let’s settle one thing right up front: if it comes out of a can, it is not a biscuit. Not that there aren’t uses for Hungry Jacks. They’re a key ingredient in monkey bread and will also make a semi-decent Krispy Kreme substitute if you’re desperate, just don’t serve them with butter and jam expecting them to pass. Some Southern folks have gotten a little lazy about the biscuit making and rely on the frozen Pillsbury variety. One advantage to these is that you can heat up however many you want and never be stuck with cold, leftover biscuits. Although for some reason my dad hasn’t caught on to this idea. He heats up a whole bunch of them at once, butters them, and then leaves them out on the counter. Just in case somebody happens by and wants a biscuit, I reckon. I really don’t get why folks would want to eat some kind of bland, biscuit-like substitute. How hard is it to make a biscuit? Ok, I will confess that I, myself, had never made a biscuit till last Saturday, but it’s not at all difficult. As often as I watched my mom making biscuits while I was growing up, you’d think I’d have the recipe embedded in my brain like a Barry Manilow song. Au contraire, mes amis. (Imagine that pronounced with a Southern accent. On second thought: don’t.) My mom didn’t have a recipe. She dumped some flour in a bowl, cut it with Crisco, poured in some buttermilk, mixed it up, dropped the dough on a cookie sheet and put them in the oven. And Voila! Light, fluffy drops of heaven on a plate. She always swore her biscuits were not as good as her sister Juanita’s, but I wouldn’t know because I never actually tasted one of my aunt’s biscuits while it was hot. My uncle J.P. had a habit of reading a bible passage before breakfast, usually directed toward someone at the table. By the time we got to eat, the o.j. was warm and the biscuits were cold. Add sour cream and stir until mixture is moistened. Mush together with your hands (wash first!) until the dough holds together with no stray flour bits. Drop onto ungreased baking sheet in biscuit-sized lumps. Slather with butter and jam (or gravy if you like. i don’t.) and eat. Then nap, if necessary. 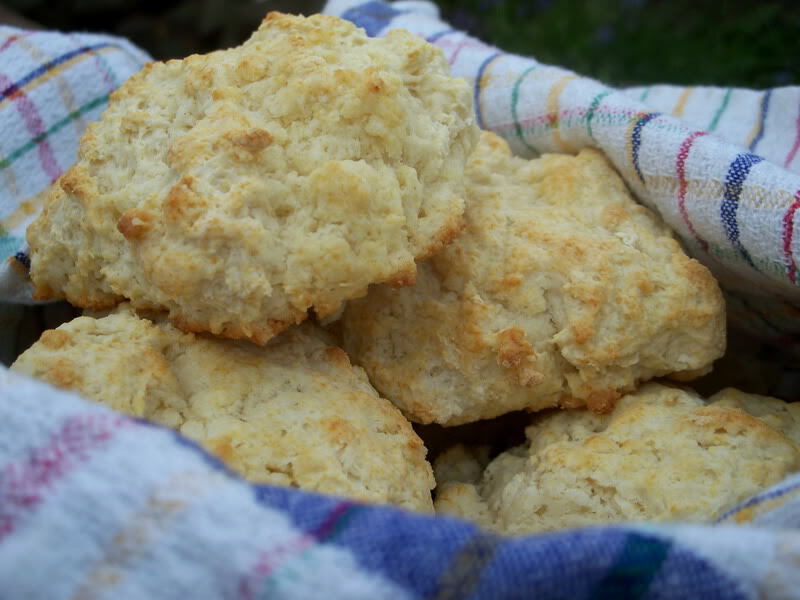 What’s your favorite biscuit recipe? Can you make them as good as your own mama? No gravy!? And you claim to be from the South?! Shame…….